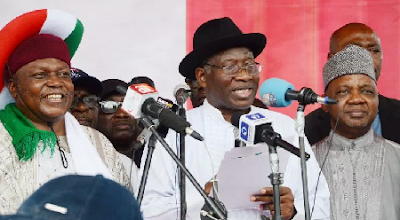 Former President, Goodluck Jonathan, says the Peoples Democratic Party (PDP) has become a reference point as Nigeria moves toward another election. He said this on Saturday in Abuja while delivering a goodwill message at the party’s National Convention. Mr. Jonathan said the party had over the years, remained focused and resilient in spite of several challenges, adding that he believed the party would remain foremost in leadership. “PDP is the only party that from the beginning, we have not changed our name or our identity in any form, we do not change based on election cycle. PDP is the only stable party in Nigeria,’’ he said. Mr. Jonathan commended the outgoing National Caretaker Committee for its leadership and doggedness, adding that it had provided energetic and purposeful leadership at a very critical and trying period in the party’s political history.